Maroon 5 Concert on September! Swoon! I just have to blog about this, baka makalimutan ko dahil sa epidural! CHOZ! Babatukan na talaga ako ng asawa ko! Haha! 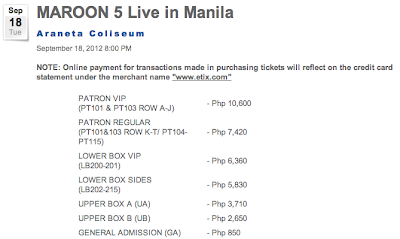 I jumped up and down when the BOS told me about Maroon 5's concert on September! I watched the first time they had a concert here, also in Araneta Coliseum! 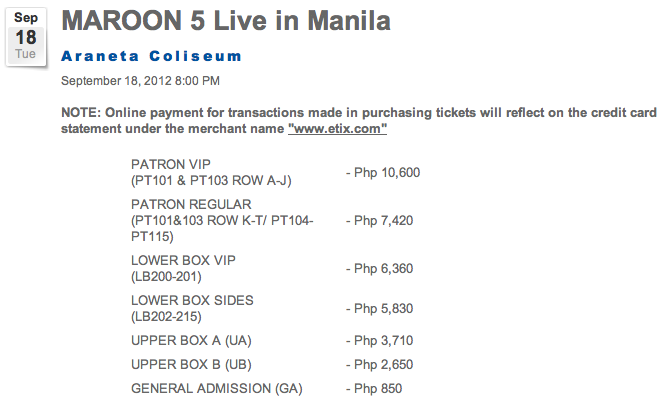 I really spent my hard earned money for that lower box ticket just to see Adam Levine! OO, crush ko siya! LOL! I wanna see him sing Moves Like Jagger live!!! O diba? Anong say mo sa ka-sexihan nya? So I checked the ticket rates at Ticketnet. Rates are not far from their concert ticket rates 4 years ago! And tanong Lower Box Sides or Lower Box VIP?! You can buy e-ticket here! P.S. I'm in no way connected with the PR or anything with this concert. FAN lang ako ng Maroon 5.